It looks like we now have some confirmed pricing of the WiFi version of the Motorola Xoom here in the UK, as UK retailer PC World has now listed the WiFi Xoom for £449.99. This pricing sounds a little better than what we had previously heard, as we presume the PC world pricing includes taxes, there are still no details on how much the 3G version will retail for. 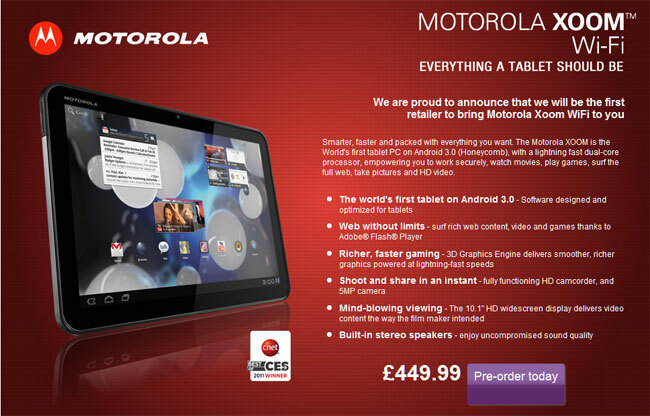 The Motorola Xoom is the first tablet to launch with Google’s new tablet designed version of Android, Android 3.0 Honeycomb and it comes with a range of impressive specifications. The Xoom features a 10.1 inch touchscreen display, the display has a resultion of 1280 x 800 pixels, processing is provided by a dual core 1GHz processor. The Motorola Xoom feature two cameras, on the front of the Xoom there is a 2 megapixel camera which is designed to be used for video chat, on the back of the Xoom there is a 4 megapixel camera, this camera can take still photos and also record High Definition video in 720p. The Xoom is capable of playing back Full High Definition video in 1080p via HDMI, other features on the Xoom include a built in accelerometer, a gyroscope, a compass and a barometer. There are no details as yet on when the Xoom will go on sale in the UK, at least now we have an idea of the pricing, as soon as we get some more information on when it will hit the stores we will let you guys know.